"Website" means all interaction with our services, including our software (both server and browser based), web pages and files, images, designs, products, data, text, charts, tables, documentation, feeds, emails and other materials. 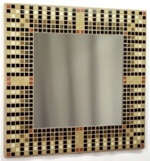 "Mosaic Design" means all aspects of an individual mosaic product shown on the website, including the design and title, photos, images, drawings and plans, pricing and description, data and documentation, manufacturing and other information and methods, artwork and appearance as well as the physical product. This User Agreement may be amended from time to time, such changes will be posted on this page. This Agreement governs the use of the website owned by Kaamar Limited (Registered in England and Wales, Company No: 5514028) of 18 Lynfield Road, Lichfield, Staffordshire, WS13 7BS (“we” and “us”) by the website user (“you”) and constitute the entire and only agreement between us in relation to such use. All use of our website shall be deemed to take place at the location of our server, in England. Much of the website can be used without creating an account or logging in to your account (as an "anonymous user"). Full use of the website, including saving mosaic designs between visits or making purchases, requires you to create an account (you are a "known user" when logged into your account). Access to your account on our website is secured by the password and security information you entered when creating the account. You are responsible for maintaining the confidentiality of the password and account, and are responsible for all activities that occur under your password or account. We will not be liable for any loss or damage arising from your failure to comply with the above. You are responsible for all content (such as text, files and images) that you post or upload to our website. All content must be lawful (eg. not defamatory, indecent, libelous or objectionable) and not infringe on the rights of others ("IP" eg. copyright, design, trademark, privacy or publicity rights). Our website does show unvetted user content - we accept no liability for such content, which is the sole responsibility of the person who originated such content. You understand that by using the website you may be exposed to content that might be unlawful, harmful or objectionable, and that you use the website at your own risk. Through our website we offer a unique and free online service with advanced tools for users to create custom mosaic designs, which we can then offer for sale as mosaic products and make for you. 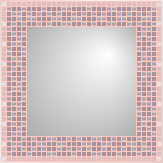 Some mosaic designs are generated by our website ("generated designs") from user interaction and from image files ("source images") uploaded by the user (or by us), while other designs ("interactive designs") are created purely by user interaction with the website, without use of a source image. Provision of this service is only possible by careful control of copyright and other IP, especially as actual sale and manufacture of an infringing mosaic design could be classed as deliberate commercial use, a criminal offence. We do not accept orders for potentially infringing mosaic designs. To allow us to offer this service, and in return for providing said service for free, we require that all mosaic designs on the website and copyright in such designs belong to Kaamar Ltd. to the maximum extent possible. We maintain a gallery of mosaic designs based on a wide variety of source images that we have chosen, checked for licence terms and adjusted where appropriate to create interesting mosaics - these mosaic designs are available to buy or can be resized or adjusted online. Alternatively, users can upload their own source image. Anonymous users must only upload their own source images (for which they are the copyright holder) and in doing so, must grant us a licence for using the image and approve the attribution. Known users may also upload other source images with suitable copyright licences or public domain images from other sources by providing extended owner, source, licence and attribution information, and in doing so must approve the attribution and either grant us a licence for using the image or confirm that you can provide such a licence from the copyright holder. To allow making of a mosaic from an image requires rights for "Commercial Use" and for "Derivative Works" without restrictions (other than an attribution), so the default license is a Creative Commons Attribution licence. The source image used for a generated design does not form part of the mosaic design and is a special case of user content, in that copyright in source images remains with the original copyright owner and is used under the specific licence granted. By creating a mosaic design using this website, you acknowledge Kaamar Ltd as the author of the work, agreeing to freely assign any ownership rights for the design over to Kaamar Ltd, such that Copyright for the resultant mosaic designs belongs to Kaamar Ltd without restriction. Under the terms of this agreement, ownership rights including Copyright in all mosaic designs and other user content that you create on the website will belong to Kaamar Ltd.
You freely transfer and assign ownership rights including Copyright in all mosaic designs and other user content that you create on the website to Kaamar Ltd.
You grant an exclusive, irrevocable, worldwide, transferable, sub-licenceable, royalty-free licence to Kaamar Ltd. to use all mosaic designs and other user content that you create on the website, including to copy, reproduce, process, adapt, modify, publish, transmit, display, manufacture, sell and distribute in any and all media or distribution methods (now known or later developed). Where law requires this licence to be in writing, you authorise Kaamar Ltd. to sign a copy of this agreement on your behalf (if allowable under law, otherwise you agree to supply Kaamar Ltd. a signed copy of these terms on demand). You grant an non-exclusive, irrevocable, worldwide, transferable, sub-licenceable, royalty-free licence to Kaamar Ltd. to use all mosaic designs and other user content that you create on the website, including to copy, reproduce, process, adapt, modify, publish, transmit, display, manufacture, sell and distribute in any and all media or distribution methods (now known or later developed). You waive all moral rights you may have in mosaic designs and other user content that you create on the website including the right to be named as author, to be an anonymous author, and the right to object to derogatory treatment. If you use the website as an anonymous user, you are expressly asserting your right (if applicable) to anonymity such that you will not be identified as the originator of all mosaic designs and other user content that you create on the website. By default, all generated designs (including interactive designs adapted from a generated design) are private, only visible to you and us. On the other hand, all other finished interactive designs are public, can be purchased or adapted by other users, and may identify you as the originator using your full name (from your account details) if you are a known user at the time. If you do not want your name to be shown alongside your interactive designs, you can change your preference settings to remain anonymous at My Account (before creating your mosaic design). If you use the site as a known user to create such an interactive design then you are expressly asserting your right (if applicable) to either be identified by name as the originator, or not to be (anonymity), as determined by this preference setting at the time. You agree to defend, indemnify and hold Kaamar Ltd., our officers, directors, employees, agents and licensors harmless from all judgments, awards, losses, liabilities, damages, costs and expenses (including but not limited to reasonable legal costs and fees) out of or based on (a) your user content and actions on the website, (b) your use of the website, (c) your connection to the website, (d) your violation of this Agreement or (e) your violation of any rights of a third party. This is our website, and we reserve the right to do what we like with it! The website is provided on an "As Is" basis with no guarantees, warrantees or endorsements of any kind, real or implied (statutory rights are not affected). We reserve the right to make any website changes without warning or justification at any time and for any reason, including but not limited to: (a) general availability of the website and content, (b) adding, editing and deleting content, (c) editing and deleting of user content, (d) editing and deleting of mosaic designs (e) editing, deleting and blocking of user accounts. We give you a personal, worldwide, royalty-free, non-assignable and non-exclusive license to use the website for the purpose of designing and purchasing mosaic products on the website. You agree not to harm the website by uploading viruses or other malicious code, not to decompile, hack, modify, extract or scrape any element of the website, not to interfere with or disrupt the website including by overloading, flooding or spamming the website and not to modify, rent, lease, loan, sell, distribute or create derivative works based on the website or the mosaic designs shown on the website, in whole or in part, other than on the website. We grant you a non-exclusive, revocable and limited license to use the website mosaic images, mosaic photos, press releases and RSS feeds strictly for the purposes of promoting the website in the condition that you provide appropriate attribution and a link to the website. Under this license you are also allowed to deep link to individual product, article or gallery web pages. We reserve the right to terminate this license at any time. We will not be liable to you for any loss of profits, direct, indirect or consequential loss or damages arising out of any problem in relation to the website, or any harm to your computer system, loss of data, use, good-will or other intangible losses that results from your access to or use of the website.